In beech-maple and hemlock-hardwoods, sandy aspen and red pine forests, roadside clearings and open rocky forests; often in drier soils than other Laxiflorae. Carex woodii, C. meadii, and C. tetanica might possibly run here or to C. laxiflora in the keys, if they were not recognized as belonging to sect. Paniceae. Even if the prominent superficial rhizomes of C. woodii are not collected, the species can be distinguished in its very strongly red-colored basal sheaths. 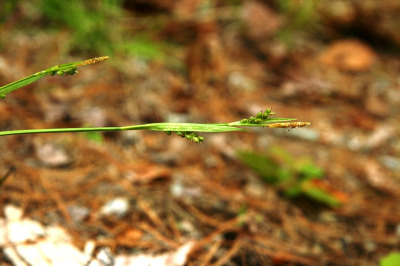 Carex tetanica and C. meadii, besides deep-seated elongated rhizomes, have the sides of the rachis of the pistillate spikes minutely papillose-granular, while in the somewhat similar species of sect. Laxiflorae the rachis is smooth, at least on the sides. MICHIGAN FLORA ONLINE. A. A. Reznicek, E. G. Voss, & B. S. Walters. February 2011. University of Michigan. Web. April 21, 2019. https://michiganflora.net/species.aspx?id=1020.